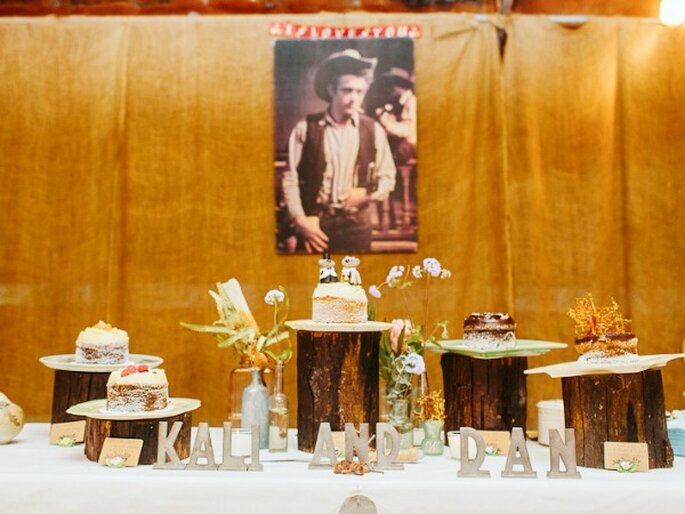 Rustic and farm style weddings are always very popular at this time of year, and trends in themes for 2014 suggest they are here to stay. 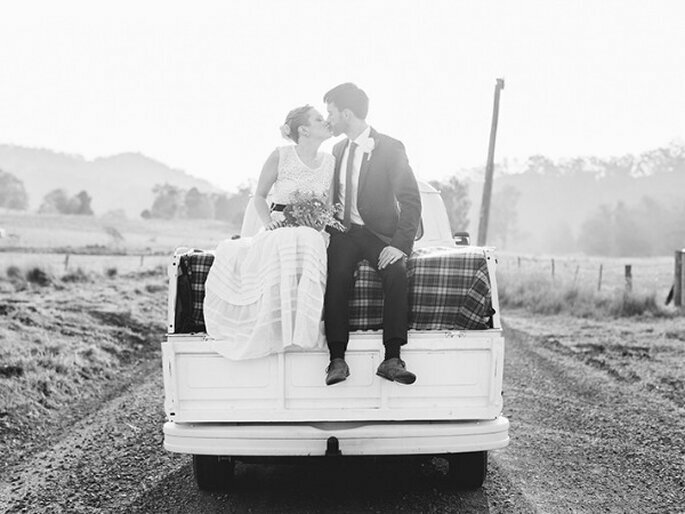 Farm weddings are the new bridal revolution of social networks. 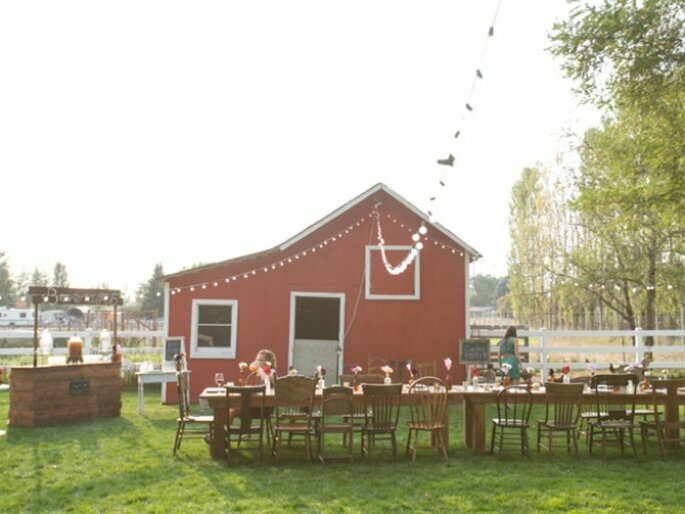 There are many pages and message boards on sites such as Pinterest dedicated exclusively to them, and they’re one of our favorite trends when it comes to decorating outdoor spaces or choosing wedding venues such as barns and fields with marquees. 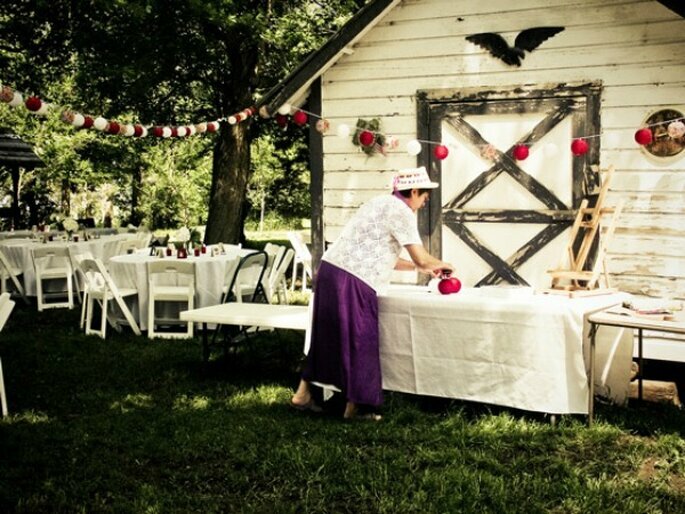 A recent trend from across the pond which we think would work amazingly well for a rustic farm wedding is the pot luck dinner. Extremely popular with special celebrations, each guest brings a dish of their choice to be shared amongst the other guests. Although this would only really be suitable for very small weddings, we can’t think of anything more intimate than a home cooked meal to share with our loved ones on such a special day. 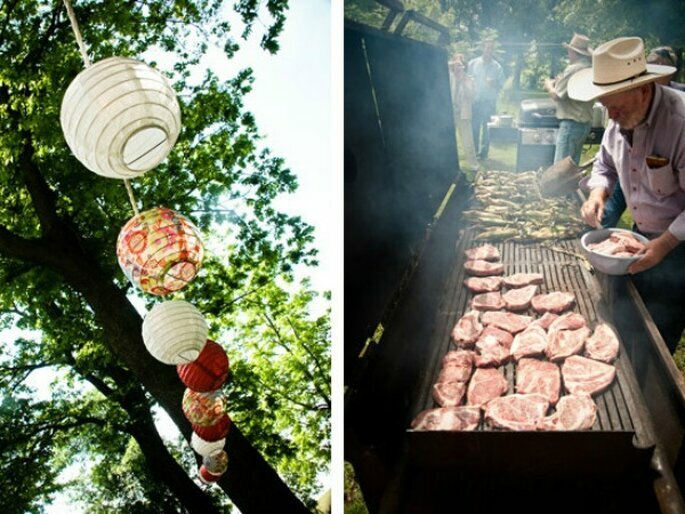 When it comes to catering – Think outdoor barbecues, hog-roasts or fun fair food – your guests will love the idea of hotdogs and candyfloss. Much more relaxed and informal than the traditional wedding breakfast! It’s important in this type of wedding that the menu and theme are in keeping with the location you have chosen for your wedding. 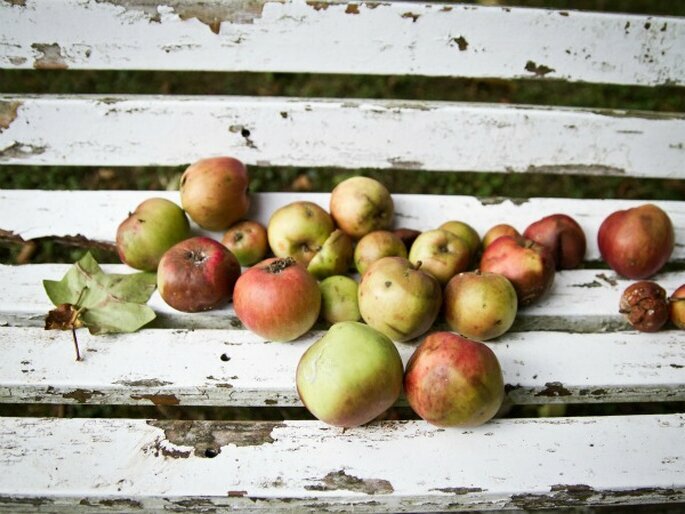 A farm or barn must be accompanied by a dinner or lunch with rustic and natural food, organic if at all possible. Think along the lines of fruits and vegetables from local farmers markets, delicious meats and cheeses from a local farm and freshly baked breads. 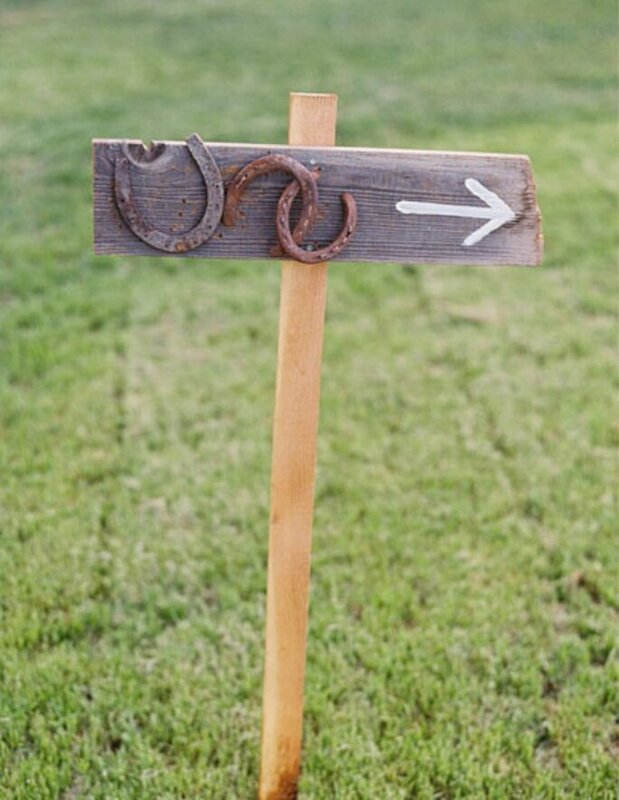 Another aspect to consider are farm props, which can be used as decorative elements or included in your photography session. 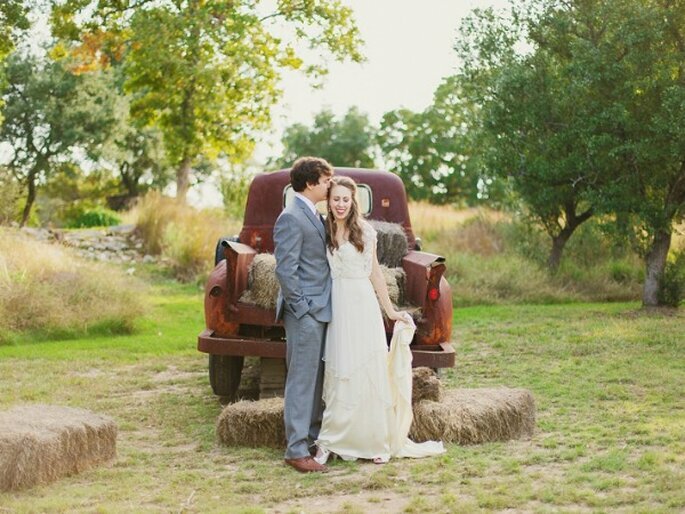 Old trucks, tractors, hay bales and even farm animals are perfect! 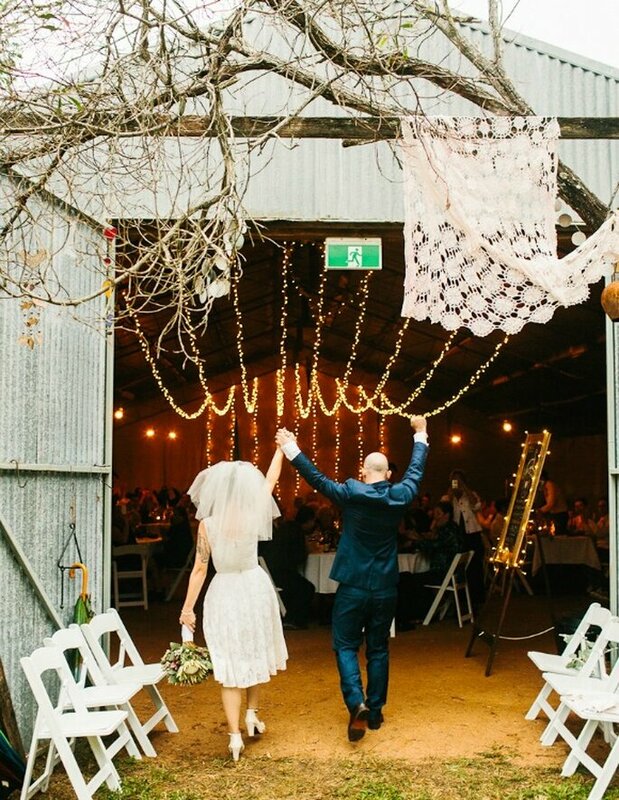 Just make sure you keep the bride’s dress away from the pig sty! The choice of space and venue is probably the most complicated element when it comes to organising a wedding with this style and theme. 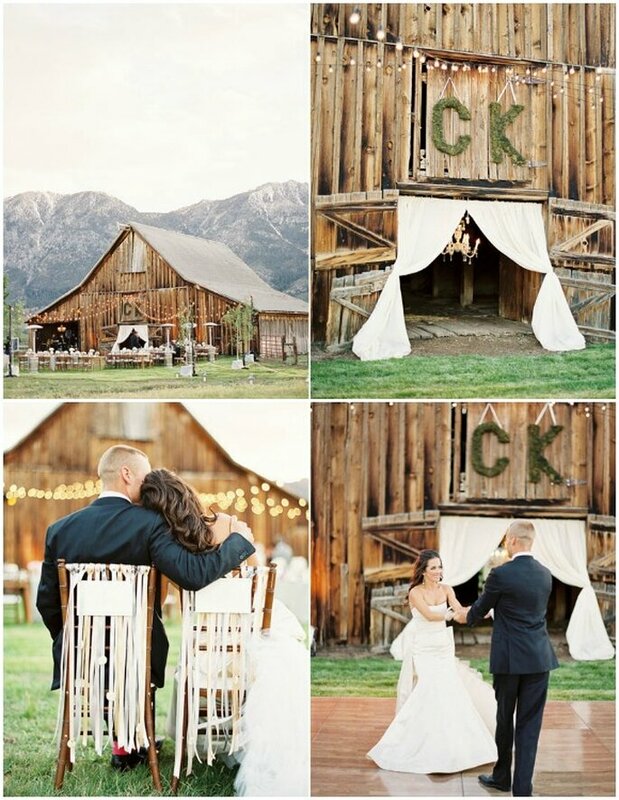 Barns are fantastic and an extremely popular choice, but not always the easiest. 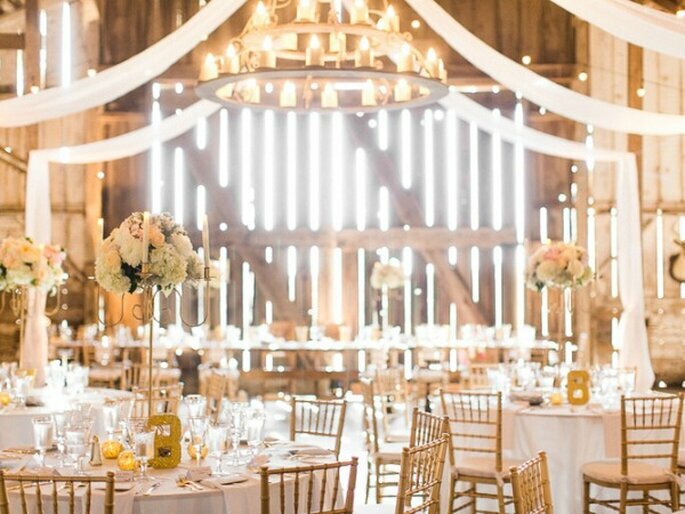 If the barn is not normally used as a reception venue then you may need to consider things such as air conditioning in the summer and heating in the winter. Other options include old windmills and farmhouses or even a vineyard, which is the ideal choice for a wine loving couple. Some vineyards can also provide wine tasting events and tours of the winery which will really wow your guests. Whatever the case, there are some decor staples that never fail regardless of venue and look great in any space. 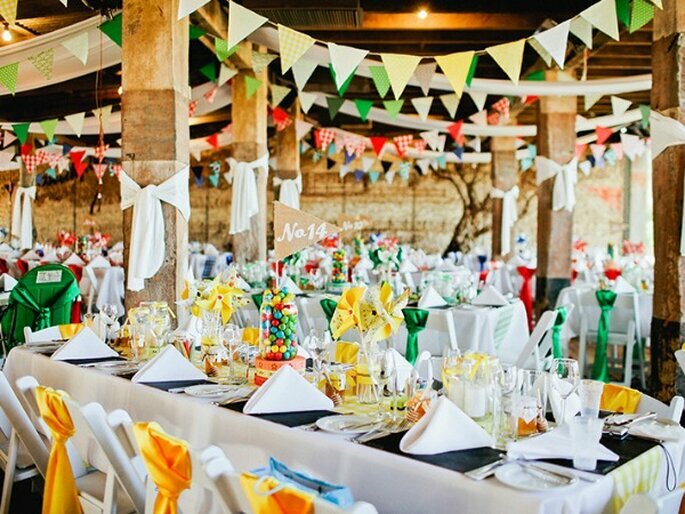 Suspended decor is one of them: bunting, pompoms, plumes of flowers hanging from the ceiling, paper lanterns and especially LED lighting and fairy lights, very effective in enclosed spaces with high ceilings. Make sure your venue has the appropriate electrical resources and enough cables to illuminate every corner. Centrepieces can also help to add to the whole feel and atmosphere. 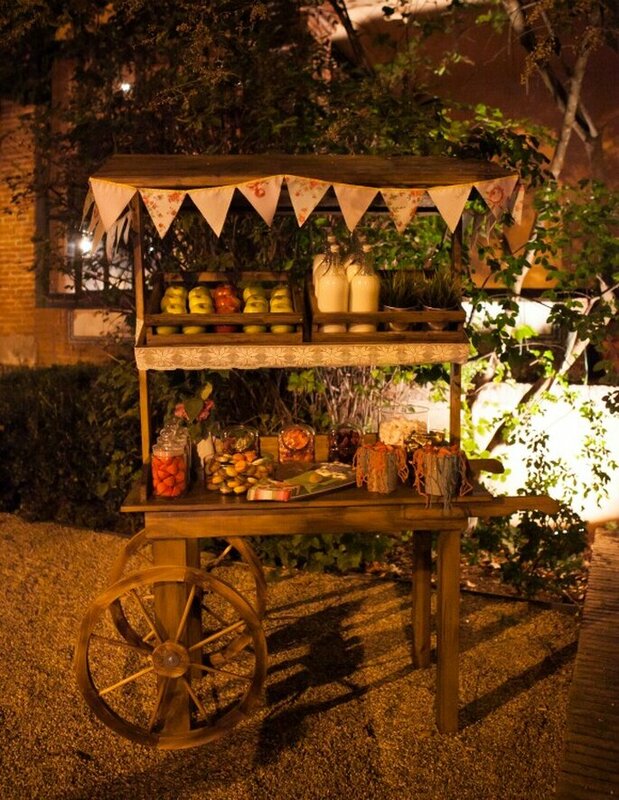 This rustic theme would lend itself well to fresh fruit, old vintage bottles filled with garden flowers, milk churns, wellington boots, wooden crates, tin cans, hay bales or even wooden logs arranged as a seating area for guests. Choosing seasonal, farm flowers is also very effective. Nothing too organised or elegant. 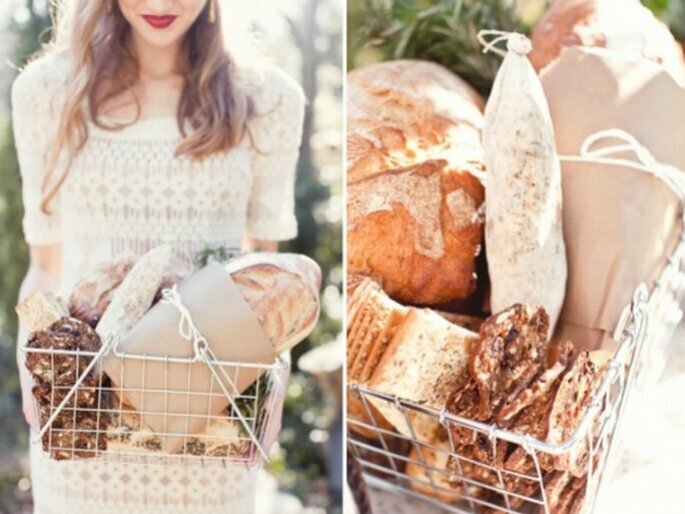 Sunflowers, wheat sheaves and lavender would look incredible as part of the bride’s bouquet. 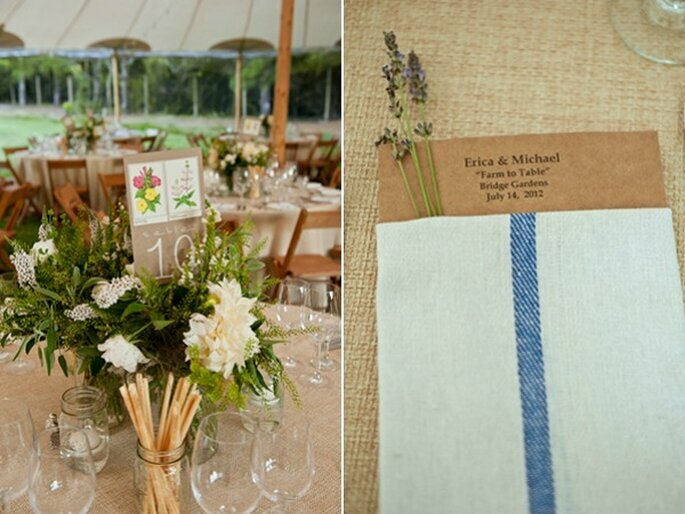 Hessian fabric can be used in a multitude of ways for this theme. To tie ribbons on the back of chairs, to tie the bride’s bouquet, tied around centrepieces and vases or as table runners. This is a great DIY fabric which can be bought online very cheaply. We’re huge fans! Don’t forget to indicate your theme in the invitations or your save-the-date cards. If you want guests to dress a little less formal or want them to dress with a certain look in keeping with your theme then you need to let them know in advance to avoid any embarrassing moments when they turn up in a tuxedo! 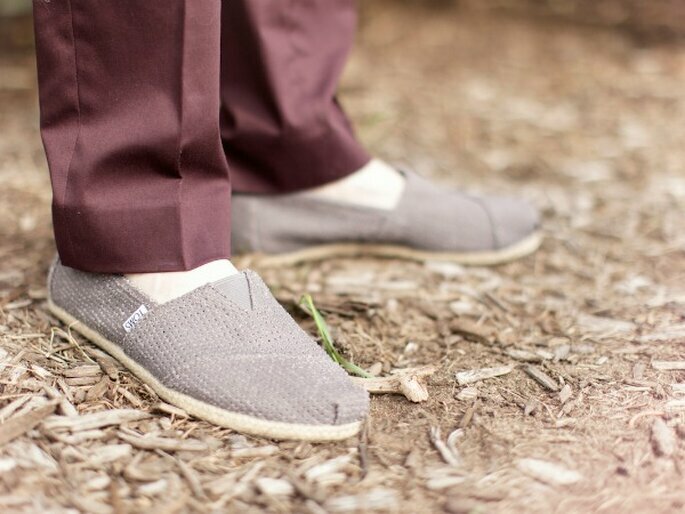 A simple linen suit for the groom would look fantastic and the bride could even get away with a short bridal dress and wellies should the UK weather be unpredictable! We love the idea of a petting farm for keeping the little ones entertained! 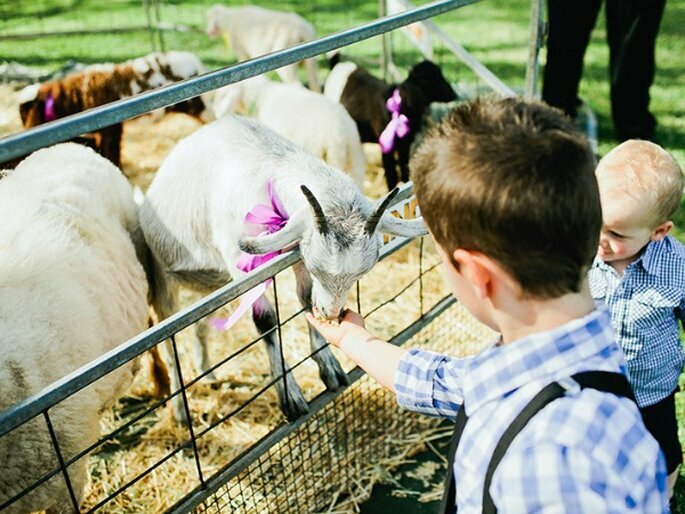 If your venue doesn’t have it’s own farm then you can hire a small petting zoo for the day, where someone from a local farm will bring a selection of sheep, goats, pigs and rabbits for children and adults to enjoy. We love this theme. 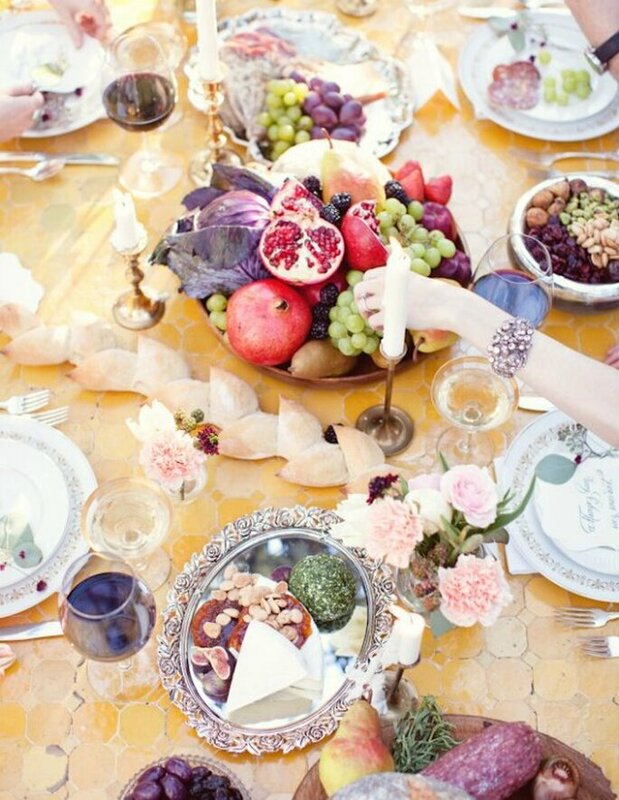 It makes us think of gorgeous rustic holidays in the French countryside eating yummy cheese and drinking delicious wine!